Shocker! Like every other Obamacare repeal bill before it, McCain is against it! 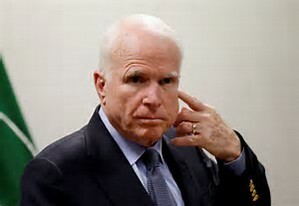 Senator John McCain of Arizona announced on Friday that he would oppose the latest proposal to repeal the Affordable Care Act, leaving Republican leaders with little hope of succeeding in their last-ditch attempt to dismantle the health law and fulfill their longstanding promise to conservative voters. Right leaning reaction to this has been pretty scathing, just like it was last July when McCain did exactly the same thing. My view on this is that although McCain’s no vote has zero to do with healthcare and 100% about giving Trump a big FU before he dies, in a backhanded way he’s doing the GOP a favor. The real villains in this story are the GOP leadership, McConnell and Ryan. They know what a real Obamacare repeal should be because the House came up with one in 2013, the Options Act. It was vetted by conservative think tanks and Tea Party groups. If they really wanted to “repeal and replace,” they could have used that as a starting point. Instead, they didn’t care about Obamacare repeal at all; they wanted to cut Medicaid to get funds to finance tax cuts without it effecting long term deficit projections. Reforming Medicaid is not a bad thing, but it has nothing to do with repealing and replacing Obamacare; Medicaid was around long before Obamacare. All of the GOP bills were terrible and none of them repealed and replaced Obamacare. In terms of fixing healthcare, it seems the GOP is a lost cause. The only avenue I see is Trump taking it out of Congress’s hands and creating a Presidential commission to come up with a repeal and replacement plan. Of course I nominate my plan as a template for America’s new healthcare model. This entry was posted in Politica and tagged Healthcare, HR4224, John McCain, Medicaid, Mitch McConnell, Obamacare, Options Act, Paul Ryan. Bookmark the permalink.